THIS DOCUMENT IS AN ELECTRONIC RECORD IN TERMS OF INFORMATION TECHNOLOGY ACT, 2000 AND RULES THERE UNDER AS APPLICABLE AND THE AMENDED PROVISIONS PERTAINING TO ELECTRONIC RECORDS IN VARIOUS STATUTES AS AMENDED BY THE INFORMATION TECHNOLOGY ACT, 2000. THIS ELECTRONIC RECORD IS GENERATED BY A COMPUTER SYSTEM AND DOES NOT REQUIRE ANY PHYSICAL OR DIGITAL SIGNATURES. PLEASE READ THE FOLLOWING TERMS AND CONDITIONS OF USE AGREEMENT CAREFULLY. IF YOU DO NOT AGREE TO THESE TERMS, EXIT THIS PAGE AND DO NOT ACCESS OR USE THE PLATFORM. The website by the domain name "www.smeshops.com" and the mobile application "SMESHOPS" (hereinafter collectively referred to as the "Platform") are owned and managed by Power2sme Private Limited, a company duly registered under the provisions of the Indian Companies Act, 1956 having its registered office at 1-B, Vikrant Enclave, Mayapuri, New Delhi, India- 110064 (hereinafter referred to as the (“Company”, "we", "us", "our"). The Company is function as a 'buying club', wherein it buys large volume of raw material/industrial goods etc. (“Industrial Goods”) from large network of manufacturers/brand owners (collectively as “OEMs”) and listed them on the Platform for its business customers to buy such Industrial Goods from the Company at competitive prices and increase their profitability and business efficiencies. The Company (i) has created and maintains the Platform, (ii) allows customers to create an user account on the Platform; (ii) collects user information, (iii) allows such business users to place orders for the Industrial Goods as listed on its Platform; (ii) provide other related services including data, reports, text, images, sounds, video, and content made available through any of the foregoing (collectively referred to as the "Content") and (iii) may provide any specialty or additional services as Company may offer to the users, from time to time (collectively referred to as the “SMESHOPS Services”). It is hereby clarified that Company is in the business of procuring large volume of Industrial Goods and provides an online venue through which Company sell Industrial Goods to the business customers and Company is not manufacturing/producing/designing the Industrial Goods purchased by You through the Platform and neither does it give any warranty and representation (of any naturewhatsoever) about the Industrial Goods. All and any warranty and representation, if any, with respect to the Industrial Goods sold on the Platform shall be from OEMs and need to be claimed by the users from such OEMs only. This Agreement shall not be deemed to create any partnership, joint venture, or other joint business relationship between the Company and any third party. To the extent You access the SMESHOPS Services through a mobile device, your wireless service carrier's standard charges, data rates and other fees may apply. 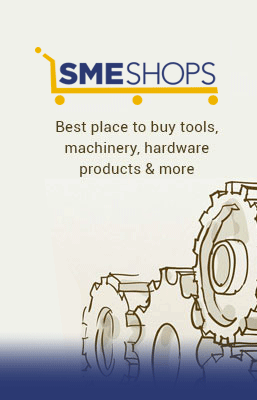 By using the SMESHOPS Services, you agree that we may communicate with you regarding SMESHOPS Services and other services provided by the Company by SMS, MMS, emails, text message, or other electronic means to your mobile device and/or through the Platform by push notifications, reminders and alerts for the purpose of providing the SMESHOPS Service and other information. You hereby acknowledge that the promotional emails, SMS/MMS may or may not be sent through third party service providers, thus, we shall have no responsibility in any manner whatsoever regarding the content of any promotional emails or SMS/MMS sent to You. The offers made in those promotional emails, SMS/MMS or otherwise shall be subject to change at the sole discretion of the Company and Company owes no responsibility to provide You any information regarding such change. In the event, You do not wish to receive any promotional email, SMS/MMS then You may contact our grievance officer regarding the same. Subject to the terms and conditions stated in this Agreement, you may access and use the Platform and any software that may be made available by the Company in connection with the SMESHOPS Services or any mobile application(s) (future or present) and which contains proprietary and confidential information that is protected by applicable intellectual property and other laws. You hereby acknowledge and agree that Company, in its discretion, at any time during the use of the Platform may not provide any part of the SMESHOPS Services. All rights, title and interest in and to the Platform and its components will remain with and belong exclusively to the Company. You shall comply with all notices, codes of conduct and policies of the Company, as published in connection with the SMESHOPS Service, and You shall promptly notify the Company if You become aware of a security breach or a potential security breach related to the Platform and/or SMESHOPS Services. Subject to the terms and conditions of this Agreement, Company grants You a limited license to access and make personal use of the Platform and not to download (other than page caching) or modify it, or any portion of it, except with express prior written consent of the Company and/or its affiliates, as may be applicable. This license does not include any resale or commercial use of the Platform or its contents; any derivative use of the Platform or its Contents; any downloading or copying of other users account information; or any use of data mining, robots, or similar data gathering and extraction tools for unauthorised collection of data. The Platform or any portion of the Platform (including but not limited to any copyrighted material, trademarks, or other proprietary information) shall not be reproduced, duplicated, copied, sold, resold, rented, leased, transferred, assigned or otherwise be exploited for any commercial purpose without express prior written consent of the Company and/or its affiliates, as may be applicable. You may not frame or utilize framing techniques to enclose any trademark, logo, or other proprietary information (including images, text, page layout, or form) of the Company without express written consent. You may not use any meta tags or any other "hidden text" utilizing the Company or its affiliate's name or trademarks without the express written consent of the Company and/or its affiliates, as may be applicable. Any unauthorized use terminates the permission or license granted by the Company and/or its affiliates, as may be applicable. You are granted a limited, revocable, and nonexclusive right to use the Platform so long as your use does not portray the Platform, the Company or its affiliates, or their products and services in a false, misleading, derogatory, or otherwise offensive manner. You may not use any of the Company’s logo or other proprietary graphic or trademark as part of the link without express written permission of the Company and/or its affiliates, as may be applicable. Company reserves the right at all times to discontinue or modify any portion of this Agreement as we deem necessary or desirable without prior notification to You. Such changes may include, among other things, the adding of certain fees or charges. We suggest to You, therefore, that you re-read this important notice containing our terms and conditions from time to time in order that You stay informed as to any such changes. If we make changes to our terms and conditions and You continue to use the Platform, You are impliedly agreeing to the terms and conditions as expressed therein. Any such deletions or modifications shall be effective immediately upon being released and/or published on the Platform. Any use of the Platform by You after such publication shall be deemed to constitute acceptance by you of such modifications. This Agreement, as modified or amended from time to time, is a binding contract between the Company and you. If you visit and use the Platform, or use SMESHOPS Services, you accept this Agreement. The Platform is freely accessible to the users however, the user will have to register with www.smeshops.com and create their account prior to availing SMESHOPS Services. If you register on behalf of a business entity, you represent that; (a) you are duly authorised by such business entity to enter into this Agreement and to bind such business entity to this Agreement (constituting a legal and binding agreement); (b) the address You provide while registering on the Platform is the principal place of business of such business entity; and (c) all other information submitted to POWER2SME during the registration process is true, accurate, current and complete. For purposes of this provision, a branch or representative office will not be considered a separate entity and its principal place of business will be deemed to be that of its head office. In case of a natural person, our services are available only to those users who can form legally binding contracts under the applicable law. Therefore, user(s) must not be a minor as per Indian Law i.e. user(s) must be at least 18 years of age to be eligible to use our services. If You are a minor i.e. under the age of 18 years, You may use the Platform only with involvement of a parent or guardian. Company hereby advises its users that while accessing the SMESHOPS Services, they must follow/abide by the related laws. SMESHOPS may, in its sole discretion, refuse any part of the SMESHOPS service to anyone at any time. This Agreement applies to user(s) if user(s) are visitors, registered - free or paid user(s) who access the Platform for any purpose. It also applies to any legal entity which may be represented by You under actual or apparent authority. User(s) may use the Platform solely for their own personal or internal purposes. This Agreement applies to all the services as may be offered by the Company on the Platform from time to time, collectively along with any additional terms and condition that may be applicable to the specific service used/accessed by the user(s). In the event of a conflict or inconsistency between any provision of the terms and conditions mentioned herein with those of the particular service, the provisions of the terms and conditions applicable to such specific services shall prevail. Payment and address details entered by You during the course of your first transaction on the Platform are securely stored by the Company to enable it to facilitate other purchases by You over the Platform. You represent and warrant to the Company that such information and Your Content is true and that You are authorized to use the payment instrument. You will promptly update your account information and Your Content with any changes (for example, a change in your billing address or credit card expiration date) that may occur from time to time. Company uses reasonable security measures to protect the data we receive via the Platform. However, we cannot guarantee that third parties will never defeat our security measures. You acknowledge that You are using the Platform and sharing Your Content and information at your own risk. You hereby agree that, You are solely responsible for all data, information, feedback, suggestions, text, content and other materials that You upload, post, deliver, provide or otherwise transmit or store in connection with or relating to the SMESHOPS Services (“Your Content”). Company reserves the right to access your account in order to respond to your requests for technical support. By posting or providing Your Content on or through the Platform, You hereby do and shall grant the Company a worldwide, non-exclusive, perpetual, irrevocable, royalty-free, fully paid, sub-licensable and transferable license to use, modify, reproduce, distribute, display, publish and perform Your Content. Company has the right, but not the obligation, to monitor the SMESHOPS Services, Platform content, your account and/or Your Content. You further agree that Company may remove or disable any content from the Platform at any time for any reason (including, but not limited to, upon receipt of claims or allegations from third parties or authorities relating to such content), or for no reason at all. making an attempt to interfere with service to any user, host or network, including, without limitation, via means of submitting a virus to the Site, overloading, "flooding," "spamming," "mailbombing" or "crashing;"
Company does not charge the users for some part of SMESHOPS Services provided including browsing, registration of the user account and placing an order etc. but may charge certain fee for any additional features as may be provided by the Company from time to time through the Platform. For the purchases made on the Platform, You will be required to make a payment and provide the Company information regarding your credit card or other payment instrument. You agree to pay the Company the amount that may be specified on the Platform for the Industrial Goods as ordered by the customer and/or other purchase made on the Platform from time to time. If You dispute any charges as charged by us, You must let the Company know within seven (7) days after which the charges will not be disputable by You. We reserve the right to change prices of the Industrial Goods at any time and shall be applicable with immediate effect. While availing any of the payment method(s) available on the Platform, we will not be responsible or assume any liability, whatsoever in respect of any loss or damage arising directly or indirectly to You due to: (a) Lack of authorization for any transaction/s, or (b) Exceeding the preset limit mutually agreed by You and between "Bank/s", or (c) Any payment issues arising out of the transaction, or (d) Decline of transaction for any other reason(s). User by using any of the payment methods as stated above and by making the payment through the Platform, hereby specifically authorized the Company to collect and process payment from You, in respect of purchases made by You through the Platform. Your relationship with the Company is on a principal to principal basis and by accepting this Agreement You agree that the Company is an independent contractor for all purposes. You understand, accept and agree that the payment facility provided by the Company is neither a banking nor financial service but is merely receiving payment for the purchases made by You on the Platform using the existing authorized banking infrastructure, Credit Card payment gateway networks etc. Company owns the Platform including all rights in patents, trademarks, trade names, copyrights, trade secrets, know-how, data (including all applications therefore), and all proprietary rights under the laws of India, any other jurisdiction or any treaty (hereinafter referred to as the “IP Rights”). No rights, title and interest in any Platform, including IP Rights, are granted to You unless specifically agreed in this Term of Use. Company grants You a limited license to access and make use of the Platform. This license does not include any downloading or copying of the content for the benefit of any third party; caching, unauthorized hypertext links to the Platform and the framing of any content available through the Platform uploading, posting, or transmitting any content that You do not have a right to make available (such as the intellectual property of another party); uploading, posting, or transmitting any material that contains software viruses or any other computer code, files or programs designed to interrupt, destroy or limit the functionality of any computer software or hardware or telecommunications equipment; any action that imposes or may impose (in Company’s sole discretion) an unreasonable or disproportionately large load on Platform’s infrastructure. You may not bypass any measures used by the Platform to prevent or restrict access to the Platform. Any unauthorized use by You shall terminate the permission or license granted to You by the Company. Unless expressly stated in this Agreement, nothing stated herein prohibits the Company from utilising any skills or knowledge of a general nature gained or created by the Company during the course of providing SMESHOPS Services through the Platform, including, information publicly known or available or that could reasonably be acquired in similar work performed for another customer of the Company. You hereby agree that, Company may publish, share or otherwise distribute, to any party the usage data, provided that such usage data is aggregated with the data from other customers/users in a manner that does not allow usage data about the user to be separated from the aggregate data and identified as relating to the user. You acknowledge that, although the internet is often a secure environment, sometimes there are interruptions in service or events that are beyond the control of the Company, and the Company shall not be responsible for any data lost while transmitting information on the internet. While it is the Company’s objective to make the Platform accessible 24X7, the Platform may not be available from time to time for any reason including, without limitation, routine maintenance or if the user is out of coverage area etc. You understand and acknowledge that due to circumstances both within and outside of the control of the Company, access to the Platform may be interrupted, suspended or terminated from time to time. The Company shall have the right at any time to change or discontinue any aspect or feature of the Platform, including, but not limited to, content, hours of availability and equipment needed for access or use. Further, the Company may discontinue disseminating any portion of information or category of information may change or eliminate any transmission method and may change transmission speeds or other signal characteristics. use the Platform in a way that unnecessarily interferes with the normal operation of the Platform or that consumes a disproportionate share of the resources of the Platform, or any component of it. post reviews, comments, photos, and other content; send communications; and submit suggestions, ideas, comments, questions, or other information, so long as the content is not illegal, obscene, threatening, defamatory, invasive of privacy, infringing of intellectual property rights, or otherwise impermissible, injurious to third parties or objectionable and does not consist of or contain software viruses, political campaigning, commercial solicitation, chain letters, mass mailings, or any form of "spam." You may not use a false e-mail address, impersonate any person or entity, or otherwise mislead as to the origin of content. Company reserves the right (but not the obligation) to remove or edit any content that in the sole judgment of the Company violates this Agreement and, or terminate your permission to access or use the Platform. You represent and warrant that You own or otherwise control all of the rights to Your Content, information that You post or You otherwise provide on or through the Platform: that, as at the date that the content or the material is submitted to the Platform: the content, the information and the material is accurate; that use of the content You supply does not breach any applicable of this Agreement and will not cause injury to any person or entity (including that the content is not defamatory); that the content is lawful. You will indemnify the Company and/or its affiliates for all claims brought by a third party against it or its affiliates arising out of or in connection with any of these warranties. Company has the right (but not the obligation) to monitor and edit or remove any activity or content. Company takes no responsibility and assumes no liability for any content posted by You or any third party. You agree that the rights You grant above are irrevocable during the entire period of protection of your intellectual property rights associated with such content and material. You agree to waive your right to be identified as the author of such content and your right to object to derogatory treatment of such content. You agree to perform all further acts necessary to perfect any of the above rights granted by You to the Company, including the execution of deeds and documents, at its request. You represent and warrant to the Company that: (i) You have full power and authority to enter into this Agreement; (ii) You own all Your Content or have obtained all permissions, releases or rights (as may be required) to obtain SMESHOPS Services of the Company; (iii) Your Content and other activities in connection with the Platform and Company’s exercise of all rights and license granted by You herein, do not and will not violate, infringe, or misappropriate any third party’s copyright, trademark, right of privacy or publicity, or other personal or proprietary right, nor does Your Content contain any matter that is defamatory, obscene, unlawful, threatening, abusive, tortious, offensive or harassing; and (iv) in case of natural person, You are eighteen (18) years of age or older. You hereby represent, warrant and confirm that You are either a retailer, industrial/ commercial entity, wholesaler, service providers, institutional or other professional business user and You are purchasing the Industrial Goods from the Company for the purpose of trade, business and profession and not for the purpose of personal consumption. You further represents and confirms that You are either an institutions having certificate of incorporation or registration as a society or registration as public trust or You have obtained any of the following license/registration certificate/membership certificate/registration, as on the date of purchase through the Platform; (i) under sales tax/ VAT registration/service tax/excise duty registration/GST registration (as may be applicable); (ii) under Shops and Establishment Act, issued by a Government Authority/Government Body/Local Self-Government Authority, reflecting that the entity/person holding the license/ registration certificate/ membership certificate, as the case may be, is itself/ himself/herself engaged in a business involving commercial activity; or (iii) permits/license etc. for undertaking retail trade (like tehbazari and similar license for hawkers) from Government Authorities/Local Self Government Bodies. You hereby further represent that by uploading any content or providing any information on the Platform, You have the lawful right to reproduce and distribute such content and that the content complies with all laws and is true and authentic and is not in any event placed on the Platform to defraud the Company and/or other parties. If You breach any of the provision of this Agreement including but not limited to the warranties listed herein, Company will have the right to immediately suspend or terminate your use of the Platform in order to prevent harm to the Company or its business and to limit any potential liability. If practicable, Company will provide notice and opportunity to cure any breach. Once cured, in Company's discretion, Company will use reasonable efforts to restore your access to the Platform. You acknowledge that Company relies on third party internet services providers and at times, actions or omissions of such third parties can impair or disrupt your connections to the internet or have an adverse effect on the SMESHOPS Services or parts thereof and may result in presenting inaccurate data on the Platform. Although Company will use commercially reasonable efforts to take actions it deems appropriate to remedy and avoid such events with respect to your use of the Platform, Company cannot guarantee that such events will not occur. Accordingly, Company excludes any and all liability resulting from, or related to, such events. The Platform is provided solely on an "as is" and “as available” basis, and your use of the Platform is at your sole risk. Company does not warrant that the Platform will be uninterrupted, error-free, or completely secure. All content, links, and SMESHOPS Services as obtained from the Platform are provided to You "as is" without warranty of any kind either express or implied. All warranties, if any, relating to the third party services would be provided by such third party service providers and not by the Company. Any claim in relation to the same should be raised against respective service provider and not us. In any case whatsoever Platform does not endorse any such third party service provider and is not responsible for (a) the accuracy or reliability of any opinion, advice or statement made through the Platform by any such party, (b) any content provided on sites linked with the Platform or (c) the capabilities or reliability of any third products or services obtained from a linked site. Other than as required under applicable consumer protection law, under no circumstance will the Company be liable for any loss or damage caused by your reliance on information obtained through the Platform or a linked site, or your reliance on any services obtained from a linked site. It is your responsibility to evaluate the accuracy, completeness or usefulness of any opinion, advice or other content available through the Platform, or obtained from a linked site. Please seek the advice of professionals, as appropriate, regarding the evaluation of any specific opinion, advice, product, service, or other content. Under no circumstances, Company shall be liable to you for any loss of profit, loss of business, business interruption, or loss of business opportunity or anticipated savings or for any indirect or consequential loss or damage of whatever kind, howsoever caused, arising out of or in connection with the SMESHOPS Services even where the possibility of such loss or damage is notified to the Company. Further, it is agreed that Company owns no responsibility in any manner over any dispute arising out of transactions by any authorized/unauthorized third party using Your account/e-mail provided by You to the Company or payments made by your credit card/debit card by any third party. You shall indemnify and hold harmless the Company, its subsidiaries, affiliates and their respective officers, directors, agents and employees, from any claim or demand, or actions including reasonable attorney's fees, made by any third party or penalty imposed due to or arising out of your breach of this Agreement or any document incorporated by reference, or your violation of any law, rules, regulations or the rights of a third party. You hereby expressly release Company and/or its affiliates and/or any of its officers and representatives from any cost, damage, liability or other consequence of any of the actions/inactions of the OEMs with respect to the Industrial Goods and specifically waiver any claims or demands that You may have in this behalf under any statute, contract or otherwise. Under no circumstances the Company shall be held liable for any delay or failure or disruption of the content or SMESHOPS Services delivered through the Platform resulting directly or indirectly from acts of nature, forces or causes beyond its reasonable control, including without limitation, failure by third party service providers connected to the Platform and/or by internet service providers, computer, telecommunications or any other equipment failures, electrical power failures, strikes, labor disputes, riots, insurrections, civil disturbances, shortages of labor or materials, fires, flood, storms, explosions, Acts of God, natural calamities, war, governmental actions, orders of domestic or foreign courts or tribunals or non-performance of third parties. User(s) hereby agree to indemnify and save the Company, its affiliates, directors, officers and employees harmless, from any and all losses, claims, liabilities (including legal costs on a full indemnity basis) which may arise from your use of the Platform (including but not limited to the display of your information on the Platform) or from your breach of any of the terms and conditions of this Agreement or your breach of any representations and warranties made hereunder or any way arising from Your Content, or your other access, contribution to, use or misuse of the SMESHOPS Services. If You are in default of your payment obligations or the payment terms as applicable on You pursuant to the purchases made on the Platform. If it is believed that your actions may cause legal liability for You, other users or us. We may at any time at our sole discretion reinstate suspended users. A user that has been suspended or blocked may not register or attempt to register with us or use the Platform in any manner whatsoever until such time that such user is reinstated by us. Notwithstanding the foregoing, if You breach this Agreement or other rules and policies, we reserves the right to recover any amounts due and owing by You to us and to take strict legal action including but not limited to a referral to the appropriate police or other authorities for initiating criminal or other proceedings against You. Termination shall not affect any liabilities incurred by a user prior to the termination or for acts performed which may result in a dispute post-termination of the Agreement and nor any provision expressed to survive or to be effective on termination and the obligations set out in this section shall remain in full force and effect notwithstanding termination. We invoice all transactions and charge all taxes as per applicable regulations. On the purchases made by You on the Platform and depending on the place were items are being shipped, we charge Goods and Service Tax i.e. Central Goods & Service Tax and State Goods & Service Tax in case of transaction within the state and for any outside state transactions, we will charge Integrated Goods and Service Tax. We charge excise duty if applicable. Excise is either included in price or separately displayed at time of checkout, whichever is applicable. We provide excise duty/MODVAT documents upon request – Contact us at support@smeshops.com. We offer tax invoice along with retail invoice where required. Company shall not be liable for its failure to perform under this Agreement and the Company policies as a result of occurrence of any force majeure events like acts of God, fire, wars, sabotage, civil unrest, labour unrest, action of statutory authorities or local or central governments, change in laws, rules and regulations, affecting the performance of Company. If any of the provision of this Agreement is deemed to be invalid, void, or for any reason unenforceable, the parties agree that the court should endeavour to give effect to the parties’ intentions as reflected in the provision, and the unenforceable condition shall be deemed severable and shall not affect the validity and enforceability of any remaining condition. From time to time Company may offer special promotional offers which may or may not apply to your account. To avail of such promotional offers, You agree to be bound by any additional terms and conditions for those special offers as may be laid down by the Company, from time to time. This Agreement, by their nature and content are intended to survive the performance hereof by any or all parties hereto shall so survive termination. The user and/or its company warrants that it shall not directly or indirectly solicit for employment, nor offer employment to, nor enter into any contract of services with any person employed by the Company. It is agreed and clarified that the arrangement set out by this Agreement and other Company policies between Company and the user is on a non-exclusive basis. This Agreement and the relationship between You and the Company will be governed by the laws as applicable in India. Any disputes will be handled in the competent courts of New Delhi, India. Either party may choose to resolve the dispute through arbitration and such arbitration proceedings shall be conducted in accordance with the provisions of the Arbitration and Conciliation Act, 1996 by a sole arbitrator to be appointed by the Company. The place of the arbitration shall be New Delhi and the language of the arbitration shall be English. The arbitral award shall be final and binding upon the parties. The failure of the Company to exercise or enforce any right or provision of this Agreement with respect to a breach by You or others does not waive its right to act with respect to subsequent or similar breaches. Except as otherwise, expressly provided in this Agreement, there shall be no third-party beneficiaries to this Agreement or license provided under this Agreement. You acknowledge that this Agreement is a contract between You or your company and us, even though it is electronic and is not physically signed by You and the Company, and it governs your use of our Platform. This Agreement constitutes the entire agreement between You and the Company and governs your use of the Platform, superseding any prior agreements between You and the Company with respect to the Platform. CONTACT US: For any complaints or queries, please contact our grievance officer.